Take all of the above ingredients and pulse them in a blender until it turns into a smooth puree. Take the pork roast and trim off all of the silver skin and excess fat then place it in a non-reactive bowl and pour the marinade over the roast. Close up the lid and let it sit over night. What you’ll get is an amazing citrus/garlic/ginger waft when you open the lid the next day that’s simply amazing! Grind up everything until its a fine powder. The smell in the kitchen will be outstanding at this point. Now, coat your roast with a bit of vegetable oil and rub the spice mixture all over the roast, covering every spot possible, especially between the bones! Place the roast on a rack and let it sit in the fridge until you’re ready to get it on the grill. I let my roast sit in the fridge for another 6 hours which allowed the rub to penetrate the surface of the roast a little bit deeper. When you’re ready set up your grill for direct heat at about 500F as you’re going to want to sear the exterior of the roast. 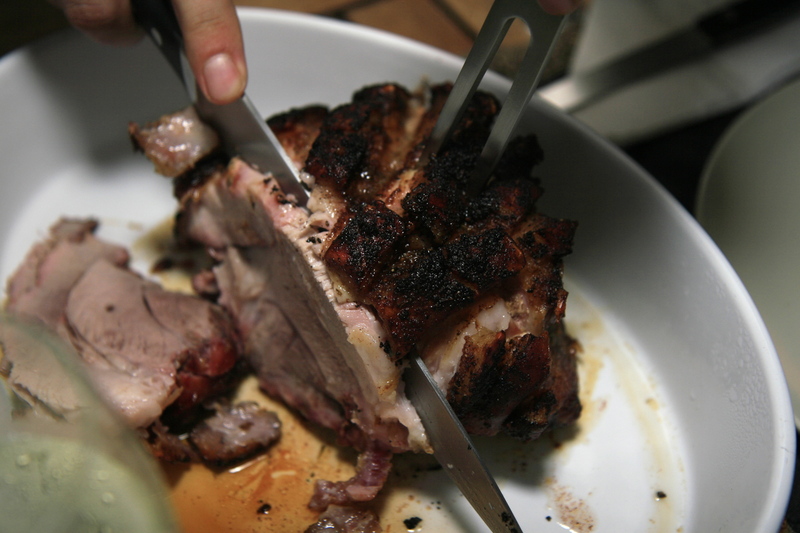 Carefully sear all sides and try not to singe your fingers in the process. Solid tongs work well here. Once seared (5-8 minutes worth) remove the roast and place it in a v-rack over a drip pan. Add about 2 inches worth of beef stock to the drip pan and insert your thermometer into the centre of the roast. Add a handful of hickory chips to the fire, shut down the vents, add your place setter for indirect heat and finally put your drip pan, rack and roast on the grid. Close the dome and shoot to stabilise the external temperature to 300F with an internal roast temperature of 140F. Without peeking, this should take about 2 hours to reach your desired internal temperature. Combine all the ingredients in to a medium sized pot. Bring it all to a boil over medium heat and then let it reduce uncovered until the plums are super soft (about 20 minutes should do it!) Transfer the mixture once cool enough to a food processor and blend it all into a thick sauce. Taste it and adjust for balance with a bit more honey or lemon juice. Having said this, the proportions above yielded a perfectly balanced sweet, salty, tart and spicy sauce. Heather absolutely loved it! Set the sauce aside and it should stay warm enough to serve on the roast. Back to the roast. Remove it when it hits an internal temperature of 140F and let it rest for about 10 minutes. Carve the roast between the bones and serve immediately. 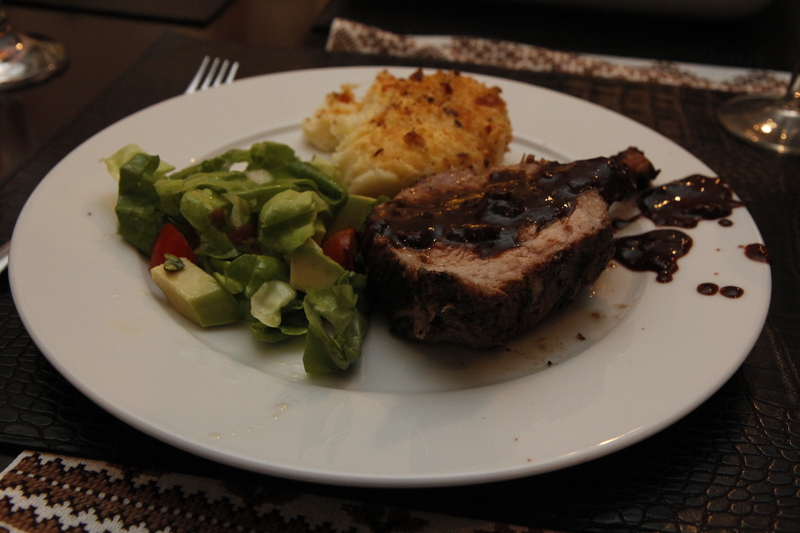 Heather prepared an amazing cheesy mash along with a simple garden salad. The result? A+++++ Its a slightly more complicated recipe but well worth all the effort. I’d like to encourage my new Egg brother Mr. Adam Shalaby from Toronto to try this recipe on his brand new Big Green Egg! Let us know how it goes Adam and welcome to the world of Eggness! Holy moly, this was no doubt one of the best pork loin roasts we’ve done this year! Why? Bacon…that’s why! What goes better with pork? Well, more pork of course!!!! This recipe isn’t overly complicated it just takes a bit of time to get everything ready. Read on and find out just how good this roast really was! Mix it all together and prep your roast. For that, simply rub some olive oil over the roast then pat the herb rub all over the top side of the roast. Now go set up your grill for direct heat (for now) as you need to sear the outside of the rack. 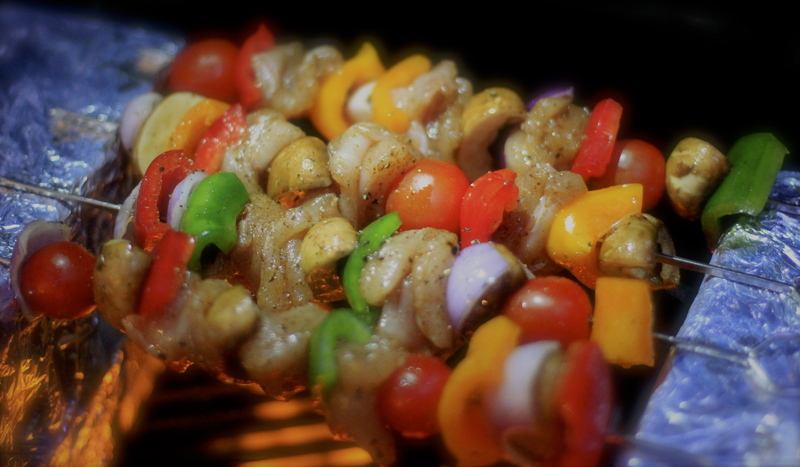 Go ahead and get the grill to about 400F and carefully get some colour on it. Be gentle as you really don’t want the herb crust to fall off. Once you’ve got some nice colour (after about 10 minutes) remove the rack and get it back into the kitchen for the final…and most amazing step….the bacon! Lay out enough rashers of bacon on a chopping block, slightly overlapping each other. Place your roast, meaty side down and then start wrapping the bacon around. I used toothpicks to temporarily hold everything in place before I trussed the roast with some butchers’ twine. Trussing it helps the roast cook evenly and it looks a little nicer when it’s all done. Lightly oil the top side of the roast (now covered in bacon) and sprinkle a bit of Kosher salt and freshly ground pepper. Now, got back to your grill and set it up for indirect heat. For BGE owners, pop in the platesetter. I threw in a small handful of hickory chips as well just to help get some extra smokey flavour to adhere to the roast. Now, drop the temperature to about 280F and insert your trusty probe thermometer into the middle of roast. 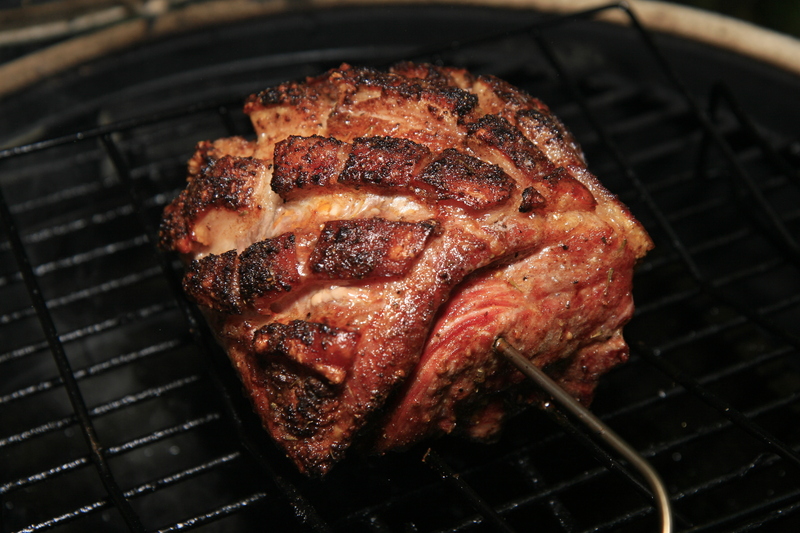 Place the roast onto a v-rack and over a drip pan containing about a cup of hot water. Drop the lid and don’t peek! You’ll shoot for an internal temperature of 145F – that should take about 90-120 minutes. Remove the roast and let it rest for about 10 minutes. Sharpen your knife and cut the butcher’s twine first then cut the roast into individual chop portions. 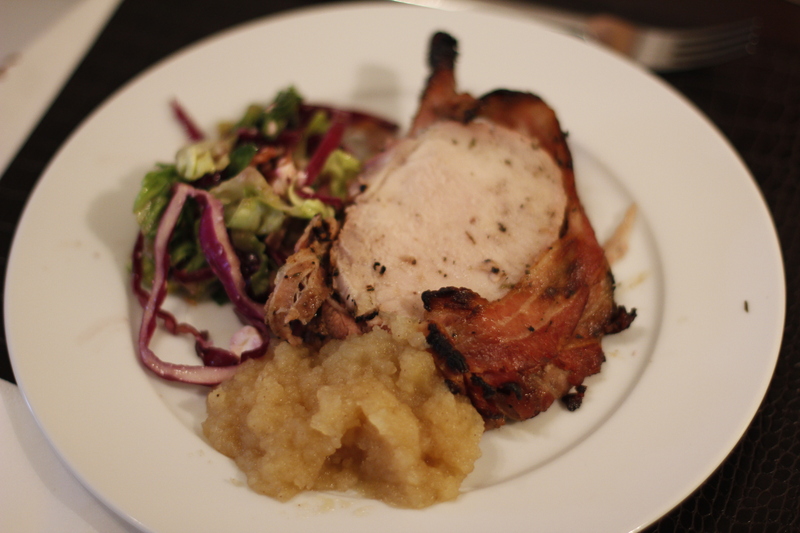 We served the pork with homemade cinnamon apple sauce and a purple cabbage and feta salad. Absolutely delicious and something I’ll do again and again! In a bowl, prepare your chicken cubes and douse them with some olive oil and coat with a light dusting of Old Bay spice seasoning. Next after you’ve sliced, diced and prepared your vegetables, put them in a deep bowl, pour a few glugs of olive oil and season with salt and pepper – easy on the salt as the Old Bay is pretty salty. Now grab your metal skewers and lube them up with a bit of oil. Spear your vegetables and chicken in any fashion you like. Make it look pretty, alternating colours and vegetables. Now all the while you should have had your grill set up for direct heat stabilised between 450-500F. Wrap your bricks in the aluminium foil and place them on the grid as far apart as possible. You’ll end up laying the skewers across the bricks, keeping the Shashlyky off the grid which prevents sticking. The other benefit of the bricks is it’s really easy to turn the skewers every 5 minutes by simply twisting the end loop. Place your Shashlyky on between the bricks, crack a bit of fresh pepper on them and close the dome and then come back every 5-7 minutes and flip the skewers. Do this about three times for a maximum cooking time of about 15-18 minutes. A quick read thermometer also helps and you know your done when the vegetables have a nice slight char and the chicken has reached an internal temperature of 165F.